Last year, I made homemade pudding for the first time and I was hooked. The problem? I’ve had that post sitting in my blog drafts and never did share just how fun of a culinary discovery it has been. So my, good friend, Lynn, is helping me out today while I am in Guatemala dreaming of just how much I would love some of this pudding. My family loves homemade pudding. It is so easy to make and tastes so much better than the box mixes you can buy at the store. I have a homemade vanilla pudding, a chocolate pudding, a lemon pudding, and a butterscotch pudding recipe on my site. I even did a video on how to make homemade pudding for those that have never tried it. Yes, we love pudding. Homemade pudding is one of my comfort foods. It is one of those quick and easy, old fashioned desserts that I love. My mom made puddings often when I was a kid and I always loved them. My love of homemade puddings has continued into my adults years. I am constantly tweaking recipes and coming up with new versions of homemade pudding. This recipe today combines my love of chocolate, with my love of mint. Chocolate and mint are a perfect combination and in this recipe they go together so well. If you have never tried making homemade pudding this recipe is a perfect one to try. In a pan whisk together sugar, cornstarch, cocoa, and salt. In a separate bowl mix together the milk and cream and slowly add to sugar/cornstarch mixture. Cook on medium high, whisking constantly until thickened. This will take about 5 minutes. Remove from heat and stir in chocolate chips and vanilla until the chips are melted. Stir in mint extract and butter. Lynn is a busy homeschooling mom who lives in northeast Oklahoma. She loves to cook and spend time in the kitchen. She writes at Lynn’s Kitchen Adventures where she shares recipes, kitchen tips, and quick and easy ideas to make your life in the kitchen easier. She also has an allergy section where she shares recipes and tips for dealing with a food allergies. Thanks for sharing! Have a wonderful day & weekend!! 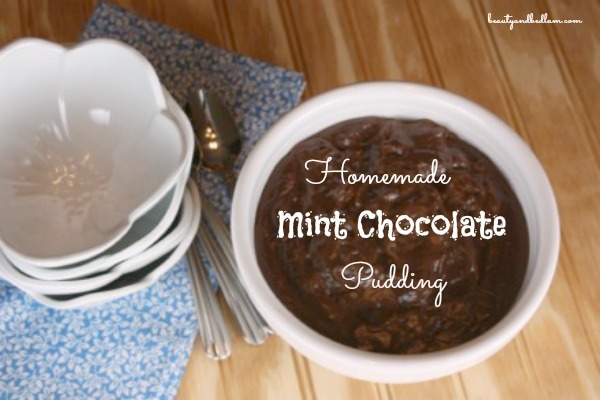 Mmm mint chocolate – one of my favorite flavor combos! I recently discovered the joys of homemade pudding myself – I couldn’t believe how easy it was to make! And how far, far superior in taste it was compared to instant. I’ll never look back! I don’t like mint chocolate (call me crazy, I know), but both my guys do. This would be a perfect way to surprise them with a treat! Thanks for filling in while Jen’s away!